My Excel spreadsheet for 2016: Ps I did not actually have $10k in the bank last year. Came up well short lol. I also am a single guy so I wasn’t feeding a family. Look at this screenshot as an example and not my final numbers. Its responsive aka it reacts to numbers you input. Also conditionally formatted. These are my go to apps for budgeting. I love my privacy, so I stayed away from apps seeking access to my accounts for monitoring. They are also very simple to use! I hate downloading an app only to find out that it is too technical. BillTracker is simply a calendar/reminder of sorts, where you put in all your bills and their respective due dates. You can set them as recurring or as 1 time. Once I pay off something in full, instead of deleting the reminder, I set it to $0 so in case I reuse the card/creditor, I still get a reminder. Spending App is also amazing. I use it to track my expenses. All my income/paycheck is input for the month, and then I log every expense to offset the income. It’s pretty useful to me because there is an iPhone widget that lets me log things in very quickly. 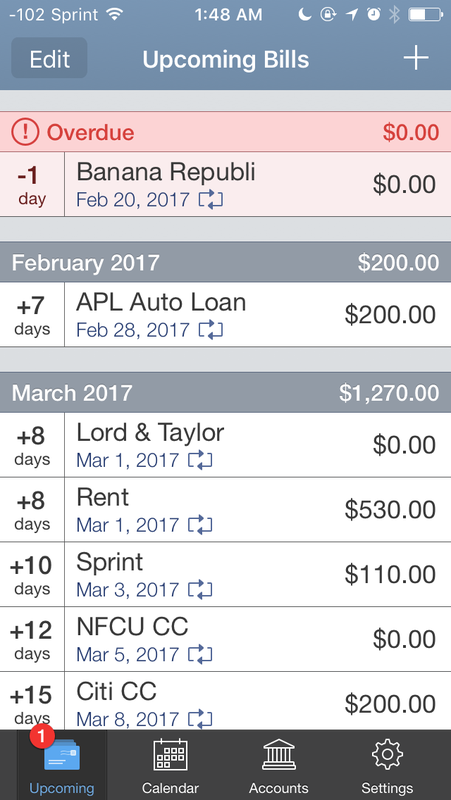 There is also a carryover feature that lets me take any positive balance from one month over to the next. Wow, I love the BillTracker app. I need to get that because as of now I have a piece of paper with due dates and stuff, and then a schedule in the notes on my phone. This sounds way easier. I definitely will say it has helped save me so much in late fees. Try it out! Thanks for the tip. I’ll check it out!